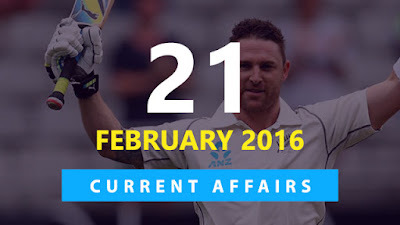 Hi Aspirants..Here is the Current Affairs Quiz for 21 February 2016. Trending topics include Sameer Anjaan - Bollywood lyricist-Record, Fastest Test Century by Brendon McCullum etc. You can check details on each topic by attempting quiz. All the Best! 1) Name the -who recently created world record by composing around 3524 different songs in 650 Bollywood movies? 2) Which player on 20 February 2016 smashed the fastest ever Test century off only 54 balls? 3) Writer and philosopher Umberto Eco who passed away on 20 February 2016 belongs to which country? 4) Union Government has recently cut interest rates on short-term small saving schemes below five years of maturity by ____ per cent including post office deposits and Kisan Vikas Patras? 5) Which bank has recently launched ‘Japan Desk’, a single window for inbound Japanese investments in India and vice-versa? 6) Boutros Boutros-Ghali who passed away in Cairo, Egypt on 17 February 2016 was the former? 7) For the first time, India has recently participated in the Cobra Gold 2016 multilateral exercise hosted by which country? 8) Taylor Swift recently won the Best album of the year in 58th Grammy awards 2016 for her album? 9) ____ recently became the first Pakistan province to adopt landmark Hindu Marriage Bill, 2015? 10) Who was recently elected as President of The Institute of Chartered Accountants of India (ICAI)?